Keith Waldrop was born in Emporia, Kansas. He attended grade school and junior high in Kansas but went to a high school at a fundamentalist school in South Carolina. Soon afterward, he attended a Pre-med program at Kansas State Teachers College but was interrupted by the draft in 1953 when he was sent as an army engineer to Germany. 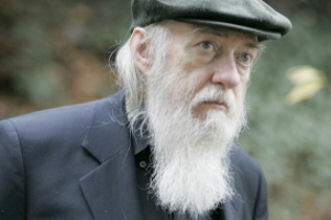 He later received a Ph.D. in comparative literature from the University of Michigan, where he married the poet and translator, Rosmarie Sebald. Waldrop moved to Providence, Rhode Island, in 1968 to teach at Brown University. I've read many stories of revenants and apparitions, but my ghosts merely disappear. I never see them. They haunt me by not being there, by the table where no one eats, the empty window that lets the sun in without a shadow. Few memories give me a sense of my childhood--perhaps, later, more will surface. Among those few is the darkened room from which proceed my mother's moans. This is not a particular moment that I remember; it is the background of many years, nearly all my early life. She moans for so many reasons that it will be difficult more than to suggest their range. Probably I am ignorant of her more exquisite pains. I know enough not to make light of lamentations. Sometimes I could get her to play the piano. She sat at the battered old upright, her eyes shut, picking out what she could remember of a Chopin polonaise or some cheap waltz from 1920. And then--what really moved her--"Brilliant Variations," by someone named Butler, or "Pass Me Not" or other hymn. I was fascinated by the way she kept her eyes closed. To glance at the music, just as to read a paragraph of print, gave her migranes. Ben Lerner is acting as Literary Executor for Keith Waldrop.